In the year 2140 Adriana was convinced she had found the perfect man: a man who was young, brave, very handsome and very intelligent. He was Victor Goodman, chosen to be the captain of the first interstellar voyage. Adriana had won a place as a crew member on the same voyage. Their romance had blossomed as they trained for the long mission that would take up twenty years of their lives. There were seven other female members of the crew, and they were all jealous of Adriana because she had become engaged to the man chosen as ship's captain for the voyage to the nearest star system, that of Alpha Centauri. But a few months before the spaceship was supposed to set forth for Alpha Centauri, a big problem arose. The crew had already had their genomes tested before they were chosen, but a second analysis was done of their genomes, looking for rare genetic deficiencies. Something was found in Adriana's genome. She had a rare genetic problem that would require a special medicine. There was no way to store up a twenty year supply of the medicine for the voyage, for the medicine had a shelf life of only six months. The mission planners had no choice. Adriana was removed from the mission crew. When they heard the news, Adriana and Victor were devastated. “Very well, my dearest,” said Adriana. “We're only in our twenties, and we'll still be fairly young when you return.” People in their generation used anti-aging pills that allowed them to have youthful bodies until the age of 80. “But how will I be able to live without you for twenty years?” asked Victor. “Yes, that will be the hard part,” said Adriana. Victor and Adriana arranged a quick marriage. Because of Adriana's genetic problem, they decided not to aim for a baby. Their wedding received wide coverage in the press. Adriana was hailed as a paragon of wifely devotion, a woman with the strength of character to wait for her husband for twenty years. The day of the lift-off into space was a tearful one for Adriana. “And you will be in my thoughts every minute,” said Adriana, weeping. 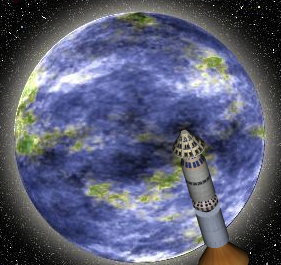 The rocketship lifted off into space, taking the crew toward the interstellar spaceship which had been constructed in space. After the crew got to the spaceship, it set forth for Alpha Centauri. During the first days, Adriana and Victor had video conversations every day. The spaceship had on its top a large antenna which transmitted the video feed back to Earth. But while the spaceship was traveling through the asteroid belt between Mars and Jupiter, all transmissions from the ship stopped. There were no replies to any of the radio messages sent from Earth. Back on Earth, people speculated about what had happened. Some thought gloomily that an asteroid had destroyed the spaceship. But Adriana was optimistic. “It's probably just some glitch that they'll fix soon,” Adriana said. But the days turned into weeks, and the weeks turned into months, and there was still no radio transmission from the spaceship. Adriana wept every day, tormented by grief and uncertainty. Before long a rich, handsome and very famous suitor named Carlo began to court Adriana. He suggested that there was no point in her being the faithful wife any more, on the grounds that her husband's spaceship must have been destroyed by an asteroid. At first Adriana resisted. But then later she began to ask herself: why bother being faithful to a husband who was probably dead? She began to stop resisting her handsome suitor Carlo. When it was finally one year since any radio transmission had been received from Victor's spaceship, Adriana filed a court petition asking that Victor be declared legally dead. After a further delay of a year, the court finally ruled in her favor. Then Adriana and Carlo married. Their marriage received much attention in the press. Carlo was already famous, and Adriana was famous from being the former wife of the world's first starship captain. But the marriage of Carlo and Adriana lasted only two years. Adriana grew tired of Carlo. What she wanted most of all was a man who would make her completely forget about Victor. And Carlo failed at that task. So Adriana asked for a divorce. Adriana then began a long series of affairs with many men, many of them famous, some married but most single. She had very many lovers, wedding none of them. Adriana kept looking for a man who was so attractive and charismatic that he would make her stop thinking every day about Victor. But she could never find such a man. Adriana's flings and affairs were widely reported in the press, for people still loved a good gossip story. Adriana became famous as a woman who had more romances and affairs with celebrities than any other woman in New York City. The press gave her the nickname of “Lady Lust.” Eventually people started to say that Adriana had slept with half of the famous men in New York. This was an exaggeration, with the actual fraction being no more than a third. After more years passed, it finally got to be the year 2160. It was twenty years since Victor's spaceship had departed. Adriana hated such an anniversary, which reminded her of the man she was trying so hard to forget. Then a startling news report suddenly appeared. Astronomers detected a space ship entering the solar system. Some thought it was an extraterrestrial spaceship. But before long the astronomers announced that it was the same spaceship that had left Earth twenty years ago. The spaceship went into orbit around Earth. The ship's landing craft left the spaceship, and landed on the great lawn of Central Park in New York. A crowd of many thousands surrounded the landing craft. Victor emerged from the landing craft, holding a large bag. Authorities gave him a microphone so he could address the huge crowd. He had not heard a word from Earth in twenty years, because the antenna of his spaceship had been destroyed when a space rock hit it. 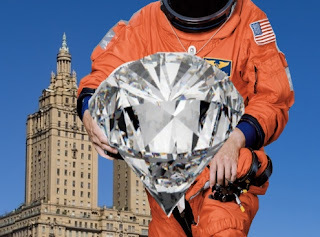 “Let me show you some of the treasures we found on the distant planet,” said Victor. “Here is a tiny ruby I found.” He took out a ruby the size of a softball. The crowd roared its approval. “And here is a little emerald I found,” said Victor. He took out an emerald the size of a basketball. The crowd was delighted. “And here is a trifling little diamond I found,” said Victor. He took out a glistening diamond three times as big as a man's head. The crowd laughed and applauded enthusiastically. First there were gasps and murmurs from the crowd. Then they turned into giggles that spread throughout the crowd. Then a wave of convulsive laughter started to rise. Soon the entire crowd of thousands was enjoying the biggest belly laugh anyone had ever heard. The crowd realized that the “faithful and virtuous” Adriana mentioned was the city's most notorious libertine, known as “Lady Lust” for her countless licentious trysts and promiscuous carnal affairs. “Why are you laughing?” asked Victor, baffled. “Did I say something funny?” He could hear the crowd cruelly chanting “Lady Lust,” but had no idea what they were referring to. After finishing his speech, Victor asked where Adriana lived, and was informed of her address in Manhattan. When he got there, he found that she had made a quick exit from her apartment, clearing out her jewels and finer clothes in a hurry. Adriana went off to live somewhere far away in secret, and was too ashamed to ever speak again to Victor. Victor was devastated when he found out about Adriana's behavior. But after a few months he got over it. It was hard for Victor to sulk too much, since he could enjoy the limelight as the most celebrated hero of the world, the only man who had ever commanded a successful interstellar mission. Adriana, on the other hand, fled from the press whenever they tried to track down where she was living. After a few years the press lost interest in her. This, of course, was not actually “science news,” but merely a report about a very speculative idea presented in the paper about the Cambrian Explosion written by the 33 scientists. Let's take a look at the wider theory advanced by these scientists, and some reasons why it comes up short. The theory is that various biological innovations in Earth's past occurred after comets dumped biological material on our planet. One of the great unsolved mysteries of biology is why there was such a massive amount of biological innovation occurring about 540 million years ago in the event called the Cambrian Explosion. During this relatively short period of time, most of the animal phyla now existing originated. For reasons discussed here, such an event has always been hard to reconcile with Darwinian ideas of slow, gradual evolution. It takes little imagination to consider that the pre-Cambrian mass extinction event(s) was correlated with the impact of a giant life-bearing comet (or comets), and the subsequent seeding of Earth with new cosmic-derived cellular organisms and viral genes (Hoyle and Wickramasinghe, 1979, 1981). There may indeed have been a complex comet debris stream implying multiple impacts over the estimated 25 million years at the start of the Cambrian explosion. The transformative genes leading from the consensus ancestral Nautilus (e.g. Nautilus pompilius) to the common Cuttlefish (Sepia officinalis) to Squid (Loligo vulgaris) to the common Octopus … are not easily to be found in any pre-existing life form – it is plausible then to suggest they seem to be borrowed from a far distant “future” in terms of terrestrial evolution, or more realistically from the cosmos at large. Such an extraterrestrial origin as an explanation of emergence of course runs counter to the prevailing dominant paradigm. 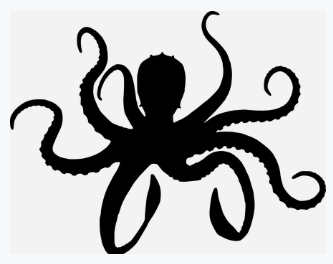 One plausible explanation, in our view, is that the new genes are likely new extraterrestrial imports to Earth - most plausibly as an already coherent group of functioning genes within (say) cryopreserved and matrix protected fertilized Octopus eggs. Thus the possibility that cryopreserved Squid and/or Octopus eggs, arrived in icy bolides several hundred million years ago should not be discounted (below) as that would be a parsimonious cosmic explanation for the Octopus' sudden emergence on Earth ca. 270 million years ago. Indeed this principle applies to the sudden appearance in the fossil record of pretty well all major life forms, covered in the prescient concept of “punctuated equilibrium” by Eldridge and Gould advanced in the early 1970s ...Therefore, similar living features like this “as if the genes were derived from some type of pre-existence" (Hoyle and Wickramasinghe, 1981) apply to many other biological ensembles when closely examined. It is certainly an interesting idea that various “information explosions” or “complexity explosions” we see in the history of life might be explained by biological material coming from comets. And the 33 authors are quite right in hinting that such cases are inadequately explained by Darwin's theory of evolution, which offers only the explanation of random mutations and natural selection, one that is weak and unconvincing for reasons discussed here. An event such as the Cambrian Explosion in which we see the rather sudden appearance of most of the existing animal phlya (with so many new body plans appearing suddenly) is something that seems to be impossible to explain while you are confined by the straight-jacket of Darwinian orthodoxy. However, there are two very big problems in the type of theory suggested by the 33 authors. The main problem has to do with the genetic code. The genetic code is the very specific system of representations used by all earthly life. It is not at all true that this genetic code follows inevitably from some laws of chemistry. The genetic code used by earthly organisms is only one of thousands of possible genetic codes that life might have been based on. So let us imagine that life appeared independently on different comets in our solar system. The life on each such comet would have its own genetic code. If life were to develop on a comet, and that comet were to crash to our planet, such life would be using a genetic code entirely different from that of the earthly life that existed before. If there had been multiple collisions of life-bearing comets on Earth, what we would expect is a variety of organisms using different genetic codes. It might, for example, be that 50 percent of life used one genetic code, and 20 percent of life used some other genetic code, and 30 percent of life used some third genetic code. Or there might be ten different genetic codes used by earthly life. But that's not what we see. All life on Earth seems to use the same genetic code. Why is it a problem that the genetic code of the extraterrestrials and terrestrials should be the same? Is the code not necessarily derived from the laws of chemistry? No, it isn't! The genetic code is not a universal cosmic code. The problem with any theory that claims extraterrestrial genetic input, is that life on Earth is a closed genetic system. I strongly disagree with Hoyle's claim that "terrestrial biology is not a closed system". (p. 3) Why? All Life on earth happens to have the same genetic code. That would be no problem, if it would be the only possible genetic code available to life. Our genetic code is one of billions and billions of possible codes. The current one looks like a 'frozen accident'. The probability that the genetic code of extraterrestrial DNA is the same as the genetic code on earth, equals the chance that a Boeing-747 arises from a junk yard! Therefore it is very hard to believe that various comets on which life independently developed have seeded our planet with new life forms. If that had happened, it would not be true that all life uses the same genetic code. 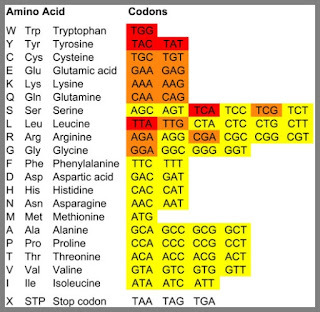 The issue of the genetic code is ignored by the paper by the 33 scientists. A second problem is that comet collisions would be extremely destructive to earthly life. A comet impact would not be as destructive as an asteroid impact. But a larger comet might have so much kinetic energy that it might cause a mass extinction if it collided with our planet. A scientist says here that a collision with a kilometer-sized comet would probably mean the end of civilization. The chance of life on a comet surviving such an impact does not seem very great. It seems that a comet collision would be likely to destroy far more species than it added to our planet because of an addition of life from the comet. Does this mean that the idea of extraterrestrial inputs to earthly biology should be discarded and dismissed? Not at all. There is a variation of this idea that gets around the genetic code problem and the collision problem. We can simply hypothesize that rather than being accidental, random inputs from comets, the extraterrestrial inputs were deliberate inputs from intelligent extraterrestrial visitors. Instead of life-bearing comets arriving at various times in the past, we can imagine life-bearing spaceships arriving here at various times in earth's history. Imagine if the beings populating an extraterrestrial expedition to our planet were to try to speed up the evolution of life on Earth. If such astronauts were to design new organisms to introduce on our planet, they would presumably create designs using the genetic code already used on our planet, rather than using some genetic code coming from their own planet (just as someone visiting Japan from England trying to spread ideas to the Japanese would create books written in Japanese rather than English). And of course, under such a spaceship theory the astronauts would not be smashing their spaceships into our planet, so you avoid the collision destruction problem. So by imagining a purposeful, directed introduction of new life forms into the Earthly biosphere, we have a “life from space” theory that avoids the two big problems of the theory of the 33 scientists. But such a smarter theory might have been avoided by the 33 scientists on the grounds that it would be hard for a paper advancing such a theory to get published, given the current state of biological academia where there exists ideological restrictions that sometimes seem as great as those in a medieval monastery. For it is a great taboo in colleges and universities for anyone to be talking about purpose, design, and deliberate intent when trying to explain the origin of Earth's living things. This taboo makes no sense at all. It is the taboo that when discussing the origin of incredibly fine-tuned biological organisms that look just like products of design and purpose, we must never suggest any explanation that involves some purposeful cause. It is the taboo that when discussing biological functionality more impressive than any electronic functionality man has produced, we must always pretend that all these biological innovations were mere accidents. And so our 33 scientists have given us a theory with two giant holes, huge problems that could have been avoided by simply imagining purposeful extraterrestrial visitations rather than purposeless extraterrestrial comet collisions. Last week the BBC reported a science experiment with the headline “'Memory transplant' achieved in snails.” This was all over the science news on May 14. Scientific American reported it with a headline stating “Memory transferred between snails,” and other sites such as the New York Times site made similar matter-of-fact announcements of a discovery. But you need not think very hard to realize that there's something very fishy about such a story. How could someone possibly get decent evidence about a memory in a snail? To explain why this story and similar stories do not tell us anything reliable about memory, we should consider the issue of small sample sizes in neuroscience studies. The issue was discussed in a paper in the journal Nature, one entitled Power failure: why small sample size undermines the reliability of neuroscience. The article tells us that neuroscience studies tend to be unreliable because they are using too small a sample size. When there is too small a sample size, there's a too high chance that the effect reported by a study is just a false alarm. The group discovered that neuroscience as a field is tremendously underpowered, meaning that most experiments are too small to be likely to find the subtle effects being looked for and the effects that are found are far more likely to be false positives than previously thought. It is likely that many theories that were previously thought to be robust might be far weaker than previously imagined. I can give a simple example illustrating the problem. Imagine you try to test extrasensory perception (ESP) using a few trials with your friends. You ask them to guess whether you are thinking of a man or a woman. Suppose you try only 10 trials with each friend, and the best result is that one friend guessed correctly 70% of the time. This would be very unconvincing as evidence of anything. There's about a 5 percent chance of getting such a result on any such test, purely by chance; and if you test with five people, you have perhaps 1 chance in 4 that one of them will be able to make 7 such guesses correctly, purely by chance. So having one friend get 7 out of 10 guesses correctly is no real evidence of anything. But if you used a much larger sample size it would be a different situation. For example, if you tried 1000 trials with a friend, and your friend guessed correctly 700 times, that would have a probability of less than 1 in a million. That would be much better evidence. Now, the problem with many a neuroscience study is that very small sample sizes are being used. Such studies fail to provide convincing evidence for anything. The snail memory test is an example. The study involved giving shocks to some snails, extracting RNA from their tiny brains, and then injecting that into other snails that had not been shocked. It was reported that such snails had a higher chance of withdrawing into their shells, as if they were afraid and remembered being shocked when they had not. But it might have been that such snails were merely acting randomly, not experiencing any fear memory transferred from the first set of snails. How can you have confidence that mere chance was not involved? You would have to do many trials or use a sample size that guarantees that sufficient trials will occur. This paper states that in order to have moderate confidence in results, getting what is called a statistical power of .8, there should be at least 15 animals in each group. This statistical power of .8 is a standard for doing good science. Whether a snail is withdrawing into its shell requires a subjective judgment, where scientists eager to see one result might let their bias influence their judgments about whether the snail withdrew into its shell or not. Also, a snail might withdraw into its shell simply because it has been injected with something, not because it is remembering something. Given such factors and the large chance of a false alarm when dealing with such a small sample size, this “snail memory transfer” experiment offers no compelling evidence for anything like memory transfer. We may also note the idea that RNA is storing long-term memories in animals is entirely implausible, because of RNA's very short lifetime. According to this source, RNA molecules typically last only about two minutes, with 10 to 20 percent lasting between 5 and 10 minutes. And according to this source, if you were to inject RNA into a bloodstream, the RNA molecules would be too large to pass through cell membranes. But when we take a close look at the issue of sample size and statistical power, and the actual experiments that underlie these claims, it seems that few or none of these claims are based on solid, convincing experimental evidence. Although the experiments underlying these claims are very fancy and high-tech, the experimental results seem to involve tiny sample sizes so small that very little of it qualifies as convincing evidence. A typical experiment goes like this: (1) Some rodents are given electrical shocks; (2) the scientists try to figure out where in the rodent's brain the memory was; (3) the scientists then use an optogenetic switch to “light up” neurons in a similar part of another rodent's brain, one that was not fear trained; (4) a judgment is made on whether the rodent froze when such a thing was done. But the main problem with such MIT memory experiments is that they involve very small sample sizes, so small that all of the results could easily have happened purely because of chance. Let's look at some sample sizes, remembering that according to this scientific paper, there should be at least 15 animals in each group to have moderate confidence in your results, sufficient to reach the standard of a “statistical power of .8.”. Let's start with their paper, “Memory retrieval by activating engram cells in mouse models of early Alzheimer’s disease,” which can be accessed from the link above after clicking underneath "Lost memories can be found." The paper states that “No statistical methods were used to predetermine sample size.” That means the authors did not do what they were supposed to have done to make sure their sample size was large enough. When we look at page 8 of the paper, we find that the sample sizes used were merely 8 mice in one group and 9 mice in another group. On page 2 we hear about a group with only 4 mice per group, and on page 4 we hear about a group with only 4 mice per group. Such a paltry sample size does not result in any decent statistical power, and the results cannot be trusted, since they very easily could be false alarms. The study therefore provides no convincing evidence of engram cells. Another example is this paper by the MIT memory lab, with the grandiose title “Creating a False Memory in the Hippocampus.” When we look at Figure 2 and Figure 3, we see that the sample sizes used were paltry: the different groups of mice had only about 8 or 9 mice per group. Such a paltry sample size does not result in any decent statistical power, and the results cannot be trusted, since they very easily could be false alarms. No convincing evidence has been provided of creating a false memory. A third example is this paper with the grandiose title “Optogenetic stimulation of a hippocampal engram activates fear memory recall.” Figure 2 tells us that in one of the groups of mice there were only 5 mice, and that in another group there were only 3 mice. Figure 3 tells us that in two other groups of mice there were only 12 mice. Figure 4 tells us that in some other group there was only 5 mice. Such a paltry sample size does not result in any decent statistical power, and the results cannot be trusted, since they very easily could be false alarms. No convincing evidence has been provided of artificially activating a fear memory by the use of optogenetics. Another example is this paper entitled “Silent memory engrams as the basis for retrograde amnesia.” Figure 1 tells us that the number of mice in particular groups used for the study ranged between 4 and 12. Figures 2 and 3 tell us that the number of mice in particular groups used for the study ranged between 3 and 12. Such a paltry sample size does not result in any decent statistical power, and the results cannot be trusted, since they very easily could be false alarms. Another unsound paper is the 2015 paper "Engram Cells Retain Memory Under Retrograde Amnesia," co-authored by Tonegawa. When we look at the end of the supplemental material, and look at figure s13, we find that the experimenters were using a number of mice that was equal to only 8 in one study group, and 7 in another study group. Such a paltry sample size does not result in any decent statistical power, and the results cannot be trusted, since they very easily could be false alarms. We see the same "low statistical power" problem in this paper claiming an important experimental result regarding memory. The paper states in its Figure 2 that only 6 mice were used for a study group, and 6 mice for the control group. The same problem is shown in Figure 3 and Figure 4 of the paper. We see the same "low statistical power" problem in this paper entitled "Selective Erasure of a Fear Memory." The paper states in its Figure 3 that only 6 to 9 mice were used for a study group, That's only about half of the "15 animals per study group" needed for a modestly reliable result. The same defect is found in this memory research paper and in this memory research paper. The term “engram” means a cell or cells that store memories. Decades after the term was created, we still have no convincing evidence for the existence of engram cells. But memory researchers are shameless in using the term “engram” matter-of-factly even though no convincing evidence of an engram has been produced. So, for example, one of the MIT Lab papers may again and again refer to some cells they are studying as “engram cells,” as if they could try to convince us that such cells are actually engram cells by telling us again and again that they are engram cells. Doing this is rather like some ghost researcher matter-of-factly using the term “ghost blob” to refer to particular patches of infrared light that he is studying after using an infrared camera. Just as a blob of infrared light merely tells us only that some patch of air was slightly colder (not that such a blob is a ghost), a scientist observing a mouse freezing is merely entitled to say he saw a mouse freezing (not that the mouse is recalling a fear memory); and a scientist seeing a snail withdrawing into its shell is merely entitled to tell us that he saw a snail withdrawing into its shell (not that the snail was recalling some fear memory). 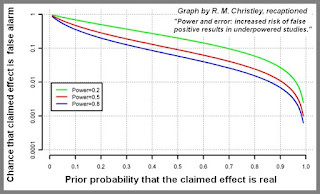 The relation between the chance of a false alarm and the statistical power of a study is clarified in this paper by R. M. Christley. The paper has an illuminating graph which I present below with some new captions that are a little more clear than the original captions. 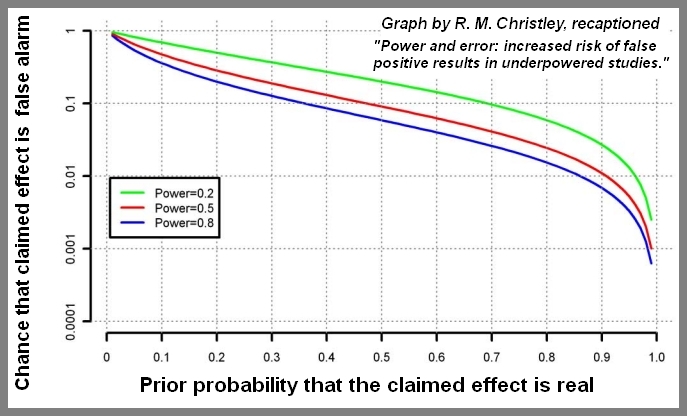 We see from this graph that if a study has a statistical power of only about .2, then the chance of the study giving a false alarm is something like 1 in 3 if there is a 50% chance of the effect existing, and much higher (such as 50% or greater) if there is less than a 50% chance of the effect existing. But if a study has a statistical power of only about .8, then the chance of the study giving a false alarm is only about 1 in 20 if there is a 50% chance of the effect existing, and much higher if there is less than a 50% chance of the effect existing. Animal studies using much fewer than 15 animals per study (such as those I have discussed) will result in the relatively high chance of false alarms shown in the green line. The PLOS paper here analyzed 410 experiments involving fear conditioning with rodents, a large fraction of them memory experiments. The paper found that such experiments had a “mean normalized effect size” of only .29. An experiment with an effect size of only .29 is very weak, with a high chance of a false alarm. Effect size is discussed in detail here, where we learn that with an effect size of only .3, there's typically something like a 40 percent chance of a false alarm. To determine whether a sample size is large enough, a scientific paper is supposed to do something called a sample size calculation. The PLOS paper here reported that only one of the 410 memory-related neuroscience papers it studied had such a calculation. The PLOS paper reported that in order to achieve a moderately convincing effect size of .80, an experiment typically needs to have 15 animals per group; but only 12% of the experiments had that many animals per group. Referring to statistical power (a measure of how likely a result is to be real and not a false alarm), the PLOS paper states, “no correlation was observed between textual descriptions of results and power.” In plain English, that means that there's a whole lot of BS flying around when scientists describe their memory experiments, and that countless cases of very weak evidence have been described by scientists as if they were strong evidence. Our science media shows very little sign of paying any attention to the statistical power of neuroscience research, partially because rigor is unprofitable. A site can make more money by trumpeting borderline weakly-suggestive research as if it were a demonstration of truth, because the more users click on a sensational-sounding headline, the more money the site make from ads. Our neuroscientists show little sign of paying much attention to whether their studies have a decent statistical power. For the neuroscientist, it's all about publishing as many papers as possible, so it's a better career move to do 5 underpowered small-sample studies (each with a high chance of a false alarm) than a single study with an adequate sample size and high statistical power. To get a power of 0.2, with an effect size of 0.51, the sample size needs to be 12 per group. This fits well with my intuition of sample sizes in (behavioral) neuroscience, and might actually be a little generous. To bump our power up to 0.5, we would need an n of 31 per group. A power of 0.8 would require 60 per group. If we describe a power of .5 as being moderately convincing, it therefore seems that 31 animals per study group is needed for a neuroscience study to be moderately convincing. But most experimental neuroscience studies involving rodents and memory use fewer than 15 animals per study group. If our intuitions about our research are true, fellow graduate students, then fully 70% of published positive findings are “false positives”.This result furthermore assumes no bias, perfect use of statistics, and a complete lack of “many groups” effect. (The “many groups” effect means that many groups might work on the same question. 19 out of 20 find nothing, and the 1 “lucky” group that finds something actually publishes). Meaning—this estimate is likely to be hugely optimistic. May 14, 2018 was another day showing that a good deal of what you read in the science news has little relation to fact. Besides some misleading neuroscience headlines I'll discuss in another post, there were news stories about some cosmological research. Fox News covered it with a headline of “Scientists believe alien life may exist in other universes after discovering a mysterious 'force. '” The “force” referred to is the cosmological constant, which was discovered to exist more than 25 years ago. So the implication of the headline (that some new force was recently discovered) is bunk. The Live Science site reported the same research as “Aliens May Well Exist in a Parallel Universe, New Studies Find.” The Daily Mail reported the same research with the headline, "Our universe may be one of many with life." The studies in question were actually “no real news” type of affairs. They considered what is called the cosmological constant or dark energy, which is basically the same as the vacuum energy density or the energy density of empty space. The studies found that in some other universe such a thing might be up to 300 times greater without ruling out life in such a universe. This is “no real news” in the sense that this was already known. What we have in our universe is a vacuum energy density or cosmological constant that seems not quite zero but very close to zero. This means that the vacuum of space is very close to being devoid of energy. So it's hardly a surprise that you could multiply by a few hundred times this “very close to nothing” energy density of the vacuum, without affecting the universe's habitability. But our science news media has distorted such studies, drawing unwarranted conclusions from them. For example, the Live Science story claimed this: “According to a new pair of studies in the journal Monthly Notices of the Royal Astronomical Society, there’s a decent chance that life-fostering planets could exist in a parallel universe.” I will now explain three fallacies involved in such claims, which certainly do not follow from the studies in question. Let us consider some particular parameter in a universe: for example, the strength of the gravitational constant. Imagine you show that such a parameter could vary by 100 times without ruining the chances of life in our universe. Would such a parameter be likely to be compatible with life's existence in a random universe? Not at all. Whether a particular parameter could be much different without ruining a universe's habitability (call this Question A) is a much different question than whether such a parameter would be likely to have a value not ruining the chances of life in a random universe (call this Question B). How can we calculate this Question B? You would have to numerically compare two ranges of values: (1) a range of values (call it Range A) that the parameter could have without preventing life in our universe; (2) a much larger set of values (call it Range B) that the parameter might possibly have had. Let's try this in the case of the gravitational constant. We know that the universe has four fundamental forces (the gravitational force, the weak nuclear force, the electromagnetic force, and the strong nuclear force). We also know that the ratio between the strongest of the forces (the strong nuclear force) and the weakest of these forces (the gravitational force) is about 10 to the fortieth power or 1040. So in estimating the set of values that any of these four forces might have had in a possible universe, a reasonable approach would be to assume that any of them might have varied by a factor of 1040. So for the gravitational constant it would seem that Range B should be something like the range of values between a value 1040 times smaller than the current value of the gravitational constant and a value 1040 times larger than the current value of the gravitational constant. But in this case Range A would only be a microscopic fraction of this Range B, because there are reasons why life could not exist in our universe if the gravitational constant was much more than about 100 times larger or smaller. The ratio between this Range A and Range B is actually about 1 in 10 to the thirty-seventh power. So in the case of the gravitational constant two things are true: (1) the current value of the constant could be no more than about a hundred times larger or smaller without ruining the universe's chance of life; (2) the chance of such luck in a random universe seems to be less than 1 in 10,000,000,000,000,000,000,000,000,000. I can give an analogy. Imagine there's an office door that requires people entering to type their 10-digit social security number. Imagine there are 100 employees in the office. In this case there are 100 random numbers you can type that would get you inside the office. But there's still only a tiny chance of success with a random number. So you should not at all make the mistake of thinking, “There's a good chance of getting in; there are a hundred numbers that will get you in.” The chance of getting in with a random number is actually less than 1 in 100 million. And similarly, the chance of a random universe having a life-compatible gravitational constant is much less than 1 in a billion, even though there are multiple random values for such a constant that might be compatible with life. In the case of the cosmological constant, we would have to consider both the Range A mentioned by these scientific papers (plus or minus 300 times) and also a vastly larger Range B representing possible values for the cosmological constant. The cosmological constant is determined by various quantum contributions to the vacuum energy density, and physicists have long told us that these contributions should be enormous. Calculations based on quantum mechanics indicate that the cosmological constant should actually be 1060 or 10120 times larger than it is. This is the problem (discussed here) called the “vacuum catastrophe” problem, the problem that reality is not matching theoretical predictions. So the Range B for the cosmological constant should be any value between 0 and a value 1060 times stronger than its value in our universe. In a random universe the energy density of a vacuum could be anywhere between nothing and the energy density of a neutron star. In this case the Range A (a value between the cosmological constant's value in our universe and a value 300 times greater) is only a tiny fraction of the Range B – less than a millionth of a billionth. So far from showing that “there’s a decent chance that life-fostering planets could exist in a parallel universe,” the very item being considered (the cosmological constant or vacuum energy density) is a reason for thinking that there would be less than one chance in a million billion of a random universe having properties compatible with life. All of these things have to be right for a universe to be habitable, for reasons discussed here and here. 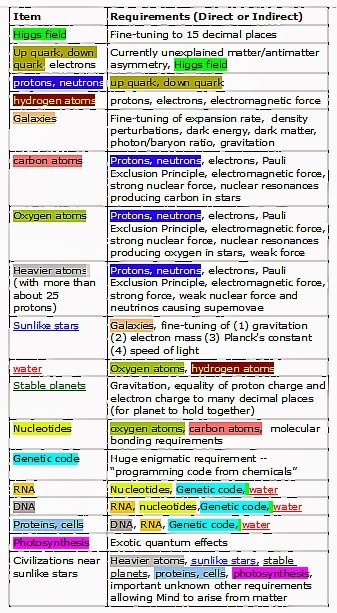 Below is a table listing some of the requirements for a universe to have civilizations (see here for a discussion of each item in the table). Click on the table to see it at better resolution. It is therefore a great fallacy for anyone to be hearing about some study regarding one particular cosmic parameter or fundamental constant, and then saying, “Oh, so it's not so hard for a universe to be habitable.” That's rather like some young lady saying, “Okay, I've got a good hairstyle, now I've got a good chance of becoming a movie star.” Just as becoming a movie star has many different requirements (such as looks, a good agent, lucky breaks, connections, and acting talent), having a universe compatible with life has many different requirements. It is important not to confuse necessary conditions and sufficient conditions. A necessary condition is some condition that must be met in order for some thing to occur. A sufficient condition is something that will guarantee that such a thing will occur. For example, buying a lottery ticket is a necessary condition for winning a lottery jackpot, but not at all a sufficient condition for such a thing. Having your head cut off is not a necessary condition for death, but it is a sufficient condition for death, guaranteeing that someone will die. In regard to the appearance of intelligent life on a planet, a habitable universe is a necessary condition for such an appearance, but not at all a sufficient condition for such a thing. Beyond the many conditions for a habitable universe, there are many additional conditions that must be met for life to get started in any universe: (1) the appearance of a genetic code; (2) the appearance at one spot of more than 100,000 base pairs achieving a functional end allowing a cell to reproduce; (3) the appearance of a molecule like DNA; (4) the appearance of a cell membrane. Then there are many additional improbable conditions that must be met for life to arise to the state of multicellular complexity and intelligence. These additional conditions are so steep that they might never occur in any of a million random universes, even if they all happened to be habitable. There are many highly improbable conditions that must be met for any random universe to be either life-compatible or compatible with the existence of stars. For reasons discussed in this post, with overwhelming likelihood a random universe would be both lifeless and light-less. The bottom line on the cosmological constant or vacuum energy density is that it is one of many needles that must be threaded for you to have a universe compatible with life, one of many distant target bulls-eyes that must be hit to end up with a universe compatible with the existence of intelligent life. Scientists lack any coherent explanation for how a brain could generate thought or intellect. Thoughts are immaterial things, so how could they possibly be generated by material things such as neurons? We know how physical things can generate other physical things (such as continental plates generating earthquakes), and we know how mental things can generate other mental things (such as one idea leading to a related idea). But nobody can give a coherent explanation as to how a physical thing such as a brain could produce a mental thing such as a thought or idea. Scientists often fall back on localization claims to try to hide this shortfall. A scientist who cannot explain the how of a brain making an idea or a decision will often try to use a where as a substitute, by suggesting that specific mental capabilities come from particular parts of the brain. A common claim is that higher thought comes from the frontal lobe of the brain. 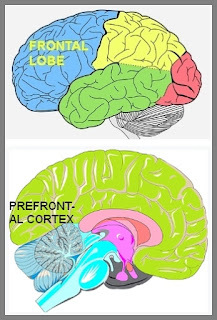 More specifically, someone may claim that higher thought comes from the front-most part of the frontal lobe, what is called the prefrontal cortex. But the evidence fails to strongly support such claims, and the evidence often conflicts with such claims. Those visuals showing “activating regions” of the brain in red are typically making use of a deceptive data presentation technique in which mere 1 percent differences in activity (or less) are represented in red, making them looking like big differences when they're really tiny differences. When you run, your heart gives a very clear signal of being involved in such a thing – for your heart rate may increase by 50 percent. But when you think, decide, or remember an old memory, there is no part of your brain that gives any clear sign of shifting into high gear or being crucially involved in such a thing. Interestingly, a recent scientific paper notes that "neuroimaging studies have shown that intelligent individuals, despite their larger brains, tend to exhibit lower rates of brain activity during reasoning." So here we have an inverse correlation between brain activity and thinking. Let us look at general intelligence and the frontal lobe. It is part of the dubious folklore of neuroscientists that the prefrontal cortex is some center of higher reasoning. But the scientific paper here tells us that patients with prefrontal damage "often have a remarkable absence of intellectual impairment, as measured by conventional IQ tests." The authors of the scientific paper tried an alternate approach, using a test of so-called "fluid" intelligence on 80 patients with prefrontal damage. They concluded "our findings do not support a connection between fluid intelligence and the frontal lobes." Table 7 of this study reveals that the average intelligence of the 80 patients with prefrontal cortex damage was 99.5 – only a tiny bit lower than the average IQ of 100. Table 8 tells us that two of the patients with prefrontal cortex damage had genius IQs of higher than 140. In a similar vein, the paper here tested IQ for 156 Vietnam veterans who had undergone frontal lobe brain injury during combat. If you do the math using Figure 5 in this paper, you get an average IQ of 98, only two points lower than average. You could plausibly explain that 2 point difference purely by assuming that those who got injured had a very slightly lower average intelligence (a plausible assumption given that smarter people would be more likely to have smart behavior reducing their chance of injury). Similarly, this study checked the IQ of 7 patients with prefrontal cortex damage, and found that they had an average IQ of 101. Cognitive levels in many children do not appear to be altered significantly by hemispherectomy. Several researchers have also noted increases in the intellectual functioning of some children following this procedure....Explanations for the lack of decline in intellectual function following hemispherectomy have not been well elucidated. Referring to a study by Gilliam, the paper states that of 21 children who had parts of their brains removed to treat epilepsy, including 10 who had surgery to the frontal lobe, none of the 10 patients with frontal lobe surgery had a decline in IQ post-operatively, and that two of the children with frontal lobe resections had "an increase in IQ greater than 10 points following surgery." The paper here gives precise before and after IQ scores for more than 50 children who had half of their brains removed in a hemispherectomy operation. For one set of 31 patients, the IQ went down by an average of only 5 points. For another set of 15 patients, the IQ went down less than 1 point. For another set of 7 patients the IQ went up by 6 points. And victims of prefrontal injuries can still pass most neurological exams with flying colors. Pretty much anything you can measure in the lab—memory, language, motor skills, reasoning, intelligence—seems intact in these people. Now let us look at whether there is good evidence that decision making is generated by the prefrontal cortex. It should be first noted that the evidence discussed above discredits such an idea, because you can't perform well on an IQ test unless you have a good decision-making ability. Each IQ test question requires you to make a decision; none are tests of learned knowledge. For example, when an IQ test asks which of 5 figures most closely resembles a particular figure, that is something that requires you to make a decision rather than just remember something you have learned. Patients with local orbitofrontal lesions performed normally (at control levels) on three-decision making tasks. There was no statistically significant difference among the four frontal subgroups and controls on letter fluency or category fluency. Pattern recognition performance (percentage correct) was not significantly impaired in either the combined frontal group or the five subgroups. On spatial recognition (percentage correct), the combined frontal group were unimpaired relative to controls. Based on the results above, you would have to conclude that the idea that the prefrontal cortex generates decisions or thoughts is false. But there's another test that neuroscientists use in cases such as these – a kind of very subtle and sneaky test. We might put this test under a category of “desperately seeking evidence of performance deterioration. The test is called the “Iowa gambling task.” A person will sit in front of a computer screen that shows four card decks. The person can pick from any of the decks, and is told that when you pick a card, your money can be either increased or decreased. Normally decks A and B give you a much higher money reward, compared to decks C and D. For example, it might be that picking from deck A will normally give you about $100, and picking from decks C and D will normally give you only about $10. But there's a sneaky catch. Occasionally decks A and B will cause you to lose a large amount such as $1200. So a person doing this test has to recognize a very subtle rule that can be detected only after 40 or 50 trials – that even though decks A and B normally give more money, they can cause big money subtractions, which means that it's really better to keep picking from decks C and D.
As a test of executive ability, the Iowa gambling task is dubious indeed. One reason is that it may be largely testing short-term memory or prolonged concentration rather than executive ability. Another reason is that it is debatable whether the assumption of the people applying this test (that picking from decks C and D is a wiser decision) is correct. It can be argued that the person who picks from decks A and B has made a correct short-term decision. Such a person is like an investor who continues to invest in the stock market because of nice annual gains even though he knows that about every 8 years or so, stock markets have nasty downturns in which investors lose 30% or so of their money. This wikipedia page on the Iowa gambling task gives some scientific papers that argue it is flawed, and should not be used to judge executive ability. In the paper I referred to above, the patients with prefrontal damage did worse on the Iowa gambling task, although whether that actually was inferior executive ability is debatable. We can summarize the paper by saying its tests provided no clear evidence that decisions are produced by the prefrontal cortex, and no clear evidence that damage to the prefrontal cortex significantly impairs executive ability. The studies above are studies involving small numbers of unusual subjects with damage in the frontal lobes. Perhaps a much better way to consider the issue of how much cognition depends on the frontal lobes (or the prefrontal cortex) is to consider a much larger class of subjects: the many millions of people older than 60. This scientific paper states this: “General linear model analyses revealed that the greatest age effects occurred in prefrontal cortex gray matter... with an average rate of volumetric decline of 4.9% per decade” after age 18. This should result in a decline in the prefrontal cortex gray matter of more than 20% by the time someone reaches 70. But we see nothing like a 20% decline in intelligence or decision-making ability in those who have reached the age of 70. People older than 70 still serve as presidents, congressmen, senators and CEO's. The Flynn effect was large enough to account for 100% of the variance in performance between age groups for cross-sectional analyses. After accounting for the Flynn effect, IQ was found to be relatively stable across the adult portion of the lifespan. Verbal abilities remain stable and even show gains through a large segment of the lifespan, while abilities measured by the Performance scale show modest declines from younger to older samples. So the study finds that after we adjust for the Flynn effect, the IQ of people about 70 is about the same as people about 20. This finding is not at all what we should expect if the prefrontal cortex is responsible for intellectual capabilities, given a decline of about 20% that should occur in the prefrontal cortex between the age of 20 and 70. I may note that the very fact of the Flynn effect is inconsistent with the dogma that our intelligence is a product of our brain. The Flynn effect, which involved an increase in IQ scores of about 3 percent per decade, went on for at least seven decades (although some think it is wearing off). During this time there was no change in human brains that could account for such a change. Another relevant point is that the human brain is currently much smaller than it was previously. A science article in the mainstream Discover magazine tells us this: “Over the past 20,000 years, the average volume of the human male brain has decreased from 1,500 cubic centimeters to 1,350 cc, losing a chunk the size of a tennis ball.” But most people would guess that humans are smarter, or as least as smart, as those who lived 20,000 years ago. Some of the most perspicacious animals are the corvids – crows, ravens, and rooks – which have brains less than 1 per cent the size of a human brain, but still perform feats of cognition comparable to chimpanzees and gorillas. Behavioural studies have shown that these birds can make and use tools, and recognise people on the street, feats that even many primates are not known to achieve. ….Among rodents, for instance, we can find the 80-gram capybara brain with 1.6 billion neurons and the 0.3-gram pygmy mouse brain with probably fewer than 60 million neurons. Despite a greater than 100-fold difference in brain size, these species live in similar habitats, display similarly social lifestyles, and do not display obvious differences in intelligence. Consider the growth of intelligence in a child. A child is born with about as many neurons as it will ever have. During the period from birth to age 18, the child's intelligence seems to grow by perhaps 300%. But there is no corresponding brain growth. The more intelligent a person, the fewer connections there are between the neurons in his cerebral cortex. This is the result of a study conducted by neuroscientists working with Dr Erhan Genç and Christoph Fraenz at Ruhr-Universität Bochum; the study was performed using a specific neuroimaging technique that provides insights into the wiring of the brain on a microstructural level.…. The researchers associated the gathered data with each other and found out: the more intelligent a person, the fewer dendrites there are in their cerebral cortex. Let's put some of these facts into a table listing predictions of the theory that your intelligence comes from your brain, comparing such predictions to reality. structure . Since about 1930, IQ scores have risen by about 3 percent per decade (the Flynn Effect). People about 70 should be much less intelligent than 20-year-olds, because of 5% volume decline in prefrontal cortex per decade. Adjusting for Flynn Effect, no such drop in intelligence occurs. Humans today should be much more stupid than humans 20,000 years ago, because our brains are smaller by about the size of a tennis ball. Most people today would guess that humans are smarter, or at least as smart, as humans 20,000 years ago. Elephants should be much smarter than humans, because their brains are three or four times heavier. Humans are actually smarter than elephants. Crows should be very stupid, because their brains are tiny, and have no neocortex. Crows are astonishingly smart. Greater number of connections in the brain should increase effective intelligence. "The more intelligent a person, the fewer connections there are between the neurons in his cerebral cortex." -- neuroscience news cited above. Men should be about nine percent smarter than women, because their brains are about nine percent bigger. It is generally recognized that on average men are not significantly smarter than women. Adults should not be much smarter than babies or toddlers, because they have no more brain cells than babies or toddlers. Adults seem to be much smarter than babies and toddlers. We see from this table that the claim that intelligence comes from the brain (specifically the frontal lobe or prefrontal cortex) massively fails to predict reality correctly. The evidence discussed here argues against the claim that the prefrontal cortex or the frontal lobe can be identified as the source of decision making or the center of higher thought in the brain. The evidence discussed here is consistent with the claim that human higher thought capability does not come from the brain but from some unknown other source. Such a claim is also supported by many other considerations discussed at this site, including (1) convincing and well-replicated laboratory evidence (discussed here and here) for psychic phenomena such as ESP, evidence suggesting that the mind has powers that cannot be explained by brain activity; (2) evidence for near-death experiences indicating minds can continue to function even when brains have shut down because the heart has stopped. Nor was intellectual disturbance primary. The frontal lobes played no essential role in intellectual function; they merely added to intellectual intricacy, and "were not intellectual centers in any sense except, perhaps, a quantitative one." Jefferson (1937) reported a series of eight frontal lobectomies in which the patients were observed for intellectual and emotional deficits following operation. There were five cases of right frontal lobectomy, three of whom were living and well when the article was written. It could be stated definitely that in two of the three cases there were no abnormalities which could be noted by the surgeon, patient, or family, and while the third case showed a mild memory defect, the operation had been too recently performed to judge whether or not the loss would be permanent. The three cases of left frontal excision likewise showed no significant changes, but comment was made that one patient was slightly lacking in reserve, another remained slightly facetious, and the third, who suffered a transient post-operative aphasia, appeared a trifle slow and diffident.